wait how did a dog get in there? 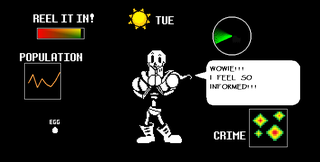 Undertale, the indie RPG created by Toby Fox, has taken over the internet. It’s fandom spreads far and wide. But also there are outsiders who look upon the praise for this little game and ask “why?” With some of the dust settling down on this game, I think it’s a good time to really discuss why this game really resonated with people and how it went about accomplishing that task. **WARNING** THIS ARTICLE IS GOING TO SPOIL THE HELL OUT OF UNDERTALE. We’re going to be diving deep into what makes this game tick, so I’m not going to be leaving anything out of this analysis. To many, Undertale is a game that is best experienced with no prior knowledge or expectations. Please consider this before reading on. YOU HAVE BEEN WARNED. It’s quirky, heartfelt, and always surprising. Let’s get the easy things out of the way first. A lot of Undertale’s charm comes from the offbeat humor and ridiculous situations. It’s the type of game where you fight dogs one moment, go on a date with a skeleton the next, and then top off the play session by going onto a cooking show with a killer robot. The game constantly throws jokes and weirdness at you, making each new even nearly impossible to predict. But the weirdness and humor never feels forced. There isn’t a feeling like it’s suffering from Ninja Pirate Zombie Robot syndrome. The land of Undertale feels like a strange and alien place similar to the setting of an Earthboud or Wario game. The weirdness feels natural because the world of Undertale is weird. The same can be said for Undertale’s humor. (I understand explaining humor is pretty much the same as killing it, but bear with me.) Undertale is completely aware of tropes it treads along and masterfully uses or subverts them for a laugh. It’s not a game that throws out joke after joke hoping most will stick. Each joke seems meticulous and honed, some unique to such specific circumstances that I wouldn’t be surprised if a majority of gamers missed them. But at the same time Undertale is never overly heavy-handed with it’s humor. It never feels manufactured or meme-ish. It just...happens. The humor in Undertale is like an inside joke between friends. It’s that funny thing you said to a coworker or that thing that happened to your friend. Undertale is fantastically stylized. It’s structured with something strong and with obvious amounts of effort and care, but it still retains an impromptu and personal quality. It has engaging and meaningful RPG elements. It’s rather hard to explain Undertale’s combat without some kind of visual medium. It’s turn-based and uses a menu reminiscent of old-school RPGs, but attacking is timing based like a Mario RPG and dodging enemy attacks is comparable to maneuvering in a bullet hell shooter. He’s an example of an early fight in the game against an unique enemy. The fight with Greater Dog is a good example of the mercy mechanics in the game. Every enemy in the game can be beaten without killing them, if the player chooses. This is accomplished by preforming certain actions until the enemy no longer wants to fight. In Greater Dog’s case, the player has to use actions in the ACT menu to play with and pet Greater Dog until it is pacified. Nonviolently confronting each monster becomes something of a conversation. The player has to find out how the monster behaves and act in a way that appeases it. For Greater Dog, it’s treating it like a normal dog. For a depressed ghost, it’s cheering him up. For a tiny walking volcano, it’s a warm hug. For a vegetable, it’s eating greens. For a towering glob of goo, it’s respecting it’s personal space. For a the son of a comedian, it’s laughing at one of his puns. 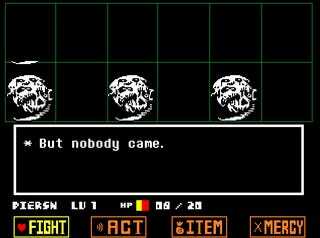 When fighting one type of monster begins to become dull Undertale switches things up with new monsters, new monster combinations (all enemy monsters attack at the same time), or adds a twist to the rules. Even at their dullest, battles are engaging and dramatic. This is especially the case in the major boss battles. So much of the boss’s personality can be seen in how they attack, the flow and changes in the battle as it progresses, and the unique rules for battling or defeating them. But the player can choose to fight enemies in a more traditional RPG manner. But fighting and killing enemies in Undertale has more consequences than killing enemies in other RPGs. Depending on who you kill or how many monsters you kill, the game world becomes a much darker place. Maps will become devoid of monsters, key characters will hate and fear you, and towns will evacuate. What other games would treat as trivial violence, Undertale treats with surprising gravity. It echoes the same themes laid out by Spec Ops: The Line. By killing enemies and growing stronger, you distance yourself from the violence until it becomes commonplace and tedious. EXP becomes Execution Points and raising LV/LOVE raises your Level of Violence. The music begins to distort, flavor text becomes more callused and cold, your save file becomes irreversibly stained. You become the monster. Whew! Let’s get back to a less heavy subject! Chiptunes aren’t everyone’s cup of tea, but Undertale’s soundtrack is undeniably catchy and could hold it’s own among the greats of the 8-to-32-bit eras. The soundtrack, like the game, is surprisingly diversified. The first few tracks heard are the game’s most simple, consisting mostly of one or two “instruments”. But as the game opens up to reveal that it is more than just another indie RPG, the music becomes more complex and branching as well. It covers everything event and setting in the game from tranquil snowy landscapes to manic flashy battles. When an early “joke” boss fight turns into a real battle, the music follows the shift in tone. The soundtrack is also a maze of reoccurring and interconnected themes. The map above shows all the songs related by lietmotifs in the music. (It might be hand to use this playlist as a reference to track names and numbers) For example the boss theme for Megaton called “Death by Glamour” shares themes from music in his “dungeon,” his tv show’s theme, and his earlier boss fight/quiz show. Undertale’s soundtrack is a web of little treats, references, and foreshadowing. 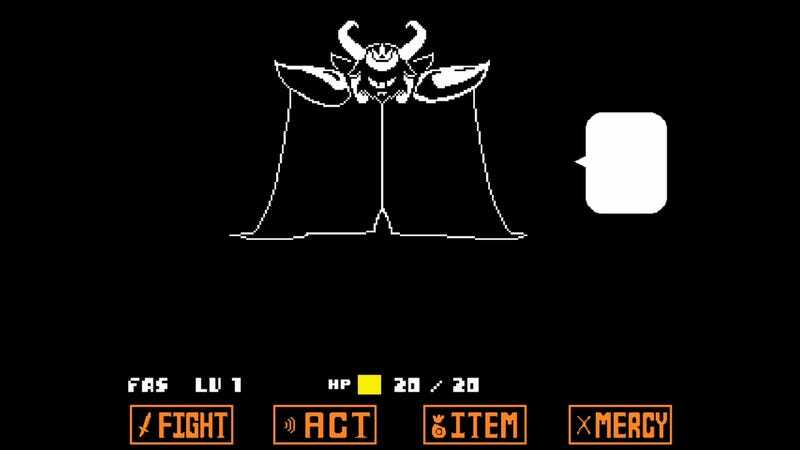 The GAME OVER screen is a reference to the death of another character, and the accompanying music and words of encouragement are lifted from big bad Asgore. The very first music you hear in the game get’s remixed into several themes in the game and can be thought as the lietmotif for the player character and Asriel. Put together, Undertale has strong soundtrack of catchy tunes that evoke strong emotions and hint at hidden connections. It has lovable characters and genuine kindness. 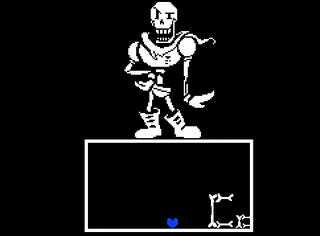 Papyrus is a loudmouth skeleton who speaks in an annoying font and sets deadly traps. 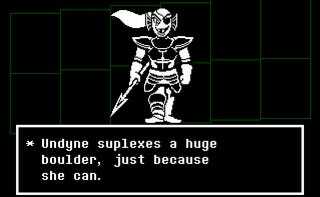 Undyne is an armored fish-woman who stops at nothing to kill the player character and steal their soul. 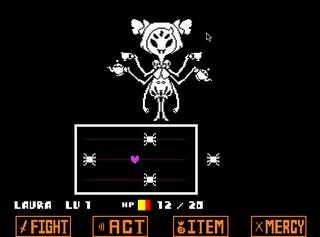 Muffet is a spider who is willing to kill any human if they don’t buy her pastries. But despite those flaws, the monsters aren’t really bad people. There’s only one or two truly “evil” characters. The characters in Undertale are presented as people who have their own problems to deal with. Their motivations by what they think is right. In the world of Undertale humans are the monsters, so their aggressive actions and quirks make sense. Papyrus just wants to be popular and famous, Undyne is fighting for what she thinks is the good of all monsterkind, and Muffet is just an extreme SJW (Spider Justice Warrior). In their stories, they are the hero and the player is the villain. But through the right actions you can show these characters that you are not their enemy. You can help them solve their problems, show them that you can get along without fighting, show them that you care. If you’re persistent and determined enough you can eventually get past your differences and become friends. Undertale fallows the same refreshing path as the point-and-click hugventure Dropsy. Most games present combat as something heroic. Violence is something to be used to solve problems. Undertale presents violence as something that makes the world worse. It makes the world darker. It divides and destroys the world in the end, quite literally. On the other hand, the “best” ending has you fighting the final boss by helping him grieve and move on with his life. The monsters are still goofy skeletons, firey fish warriors, and fabulous robots, but those traits are all built on hearts and motivations of the character. You end their loneliness, fix their romances, and help them face fears. Things don’t always work out the way you want, but in the end you work together to find happiness. You establish bonds with these characters that go beyond loyalty meters or giving them gifts they like. Upon completing the game on a pacifist run, many players (including myself) found it extremely hard to reset the game or attempt a “genocide” play through. That is how strong players feel about these characters. It’s surprisingly dark and heavy. For the most part, Undertale is an upbeat RPG. But lurking underneith it is a game that delves into some really dark territory. We’ve already touched on the battle system and how it degrades your character with each kill, but the game uses other means to really crawl under your skin. Will you betray your pacifism and fight an enemy who can’t be reasoned with? How do cope when you’ve made a horrible mistake. Do even the most terrible murderers deserve a second chance. That creature up there is Flowey the flower. He’s a viscous sad little creature that stalks the player throughout the game. He remembers all the times you die and all the people you’ve murdered. He’ll torment you, passing judgement on your actions to try and drag you down to his level. He also gains godlike power just so he can kill you over and over and over. The moments when the game becomes dead serious and horrifying are even more shocking due to the contrast with the happy-go-lucky nature of the rest of the game. But at the same time, these dark segments make persevering through them feel even more rewarding. It gives meaning to the player’s determination. Another reason that Undertale get’s under people’s skin so easily is because it is handles it’s own meta element so well. It’s not the kind of game that just smashes the fourth wall, it crawls over it, touches it, and twists it for it’s benefit. For instance, the battle system menu is supposed to be symbolic. It’s a depiction of what you are doing. When you select an attack or dodge enemy attacks, what happens is more of a simulation of the actions. Except when it isn’t. Sometimes the menus and action sequences are treated like very real things that the characters can interact with. Some enemies will remark on menu or hud elements. (See top image.) Some enemies are directly affected by actions in the simulated spaces. Sometimes unnatural enemies “glitch” the system. Other times, enemies will literally destroy options in the menu. The world of Undertale seems to run on Wreck-It Ralph and Toy Story logic. It’s a game world that runs on game logic and game systems. The systems in place are treated as real physical laws in the game. Sometimes these laws are known to all characters and are treated as natural. For other systems, characters seem to show an acute awareness. For instance, saving and loading are treated as real abilities the player has to alter Undertale’s reality. But only a few characters in the game seem to be aware of saving and loading. 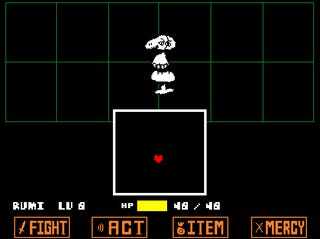 Characters like Flowey remember events between saves, loads, and resets. Some characters only seem to experience it as a sense of déjà vu. Others are oblivious. This makes interpreting some of the the game’s lore and other hidden aspects fuzzy, maybe even impossible. The game references character, W.D. Gaster, through whispers. Only one character cryptically acknowledges him, while all the other refences can be found through data mining the game, subtle visual clues that could just be nothing, or by “ghosts” that sometimes appear throughout the game. It’s up for debate as to weather Gaster is a “real” character in the game that helped shape the world or if he’s representative of cut content and exists in some kind of Limbo in the game. Part of the fun of Undertale is that even though it is a relatively small game it hides so many secrets. Items have situational uses or unexplained meanings that almost anything can lead to a new discovery. Piecing together the evidence, debating the nature of the game, and trying to find answers to questions is part of why the community for Undertale still runs strong. It’s very similar to the Dark Souls and Five Nights at Freddie’s communities. Could Gaster be real content somewhere in the game? It’s up to fans to band together and find the truth. It’s just a really good game. I won’t go go on record as saying Undertale is a perfect game or that it is the best game ever. I’ll admit that I thought Undertale has some pacing flaws at times. But these issues are small and don’t stop Undertale from being a really well put together game. It’s purposeful, heartfelt, and earnest. It might not be everyone’s cup of tea, but it’s easy to see why it has become so popular and why it has impacted as many gamers as it has. This is the part of the article where I say my name is Zachary D Long and you can follow me on Twitter @invadingduck . I’d also like to make the disclaimer that I did not make any of the art of videos used in the article. Those were other awesomer people. Now that that’s over, leave a comment if you got a question or if you got something to add. I didn’t cover everything, so it’d be nice if we could talk about the game some more.